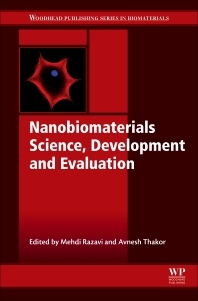 Nanobiomaterials Science, Development and Evaluation examines the practical aspects of producing nanostructured biomaterials for a range of applications. With a strong focus on materials, such as metals, ceramics, polymers, and composites, the book also examines nanostructured coatings and toxicology aspects. Chapters in Part One look at materials classes and their synthesis with information on all major material groups. Part Two focuses on nanostructured coatings and practical aspects associated with the use of nanobiomaterials in vivo. This book brings together the work of international contributors who are actively engaged on the forefront of research in their respective disciplines, and is a valuable resource for materials scientists in academia, industry, and all those who wish to broaden their knowledge in the allied field. Dr. Mehdi Razavi is a Postdoctoral Research Fellow in Regenerative Medicine at Stanford University School of Medicine Department of Radiology. Prior to this appointment he was Postdoctoral Research Fellow in Biomaterials with the Brunel Centre for Advanced Solidification Technology (BCAST) in Institute of Materials and Manufacturing, and Brunel Institute for Bioengineering (BIB) at Brunel University London and Research Scholar in Biomaterials and Tissue Engineering with the School of Materials Science and Engineering, Helmerich Advanced Technology Research Center (HRC), at Oklahoma State University. He holds a PhD in Biomaterials from Isfahan University of Technology and Isfahan University of Medical Sciences in August 2014, MS in Materials Engineering from Isfahan University of Technology in February 2011 and BS in Materials Engineering from Isfahan University of Technology in September 2008. His current multi-disciplinary research program is focused on biomaterials, tissue engineering, regenerative medicine, and nanotechnology. Dr. Thakor is an Assistant Professor and Clinician-Scientist at Stanford University. He is dual fellowship trained in both pediatric and adult Interventional Radiology having undertaken Interventional Radiology fellowships at the University of Cambridge (Addenbrookes Hospital), University of British Columbia (Vancouver General Hospital) and University of Toronto (SickKids Hospital). His first PhD was in fetal cardiovascular physiology at the University of Cambridge which he then followed with another doctoral degree in Molecular Imaging and Nanotechnology at Stanford University and the University of Cambridge. Dr Thakor’s current interests are in developing and translating minimally invasive Regenerative Medicine techniques, stem cell biology and applications, and the development of new bioactive transplantable scaffolds.